The Tampere tram project will connect Hervanta with Lentävänniemi. Image courtesy of YIT Corporation. The construction of the tram line is expected to be completed by 2024. Image courtesy of Jorge Franganillo. 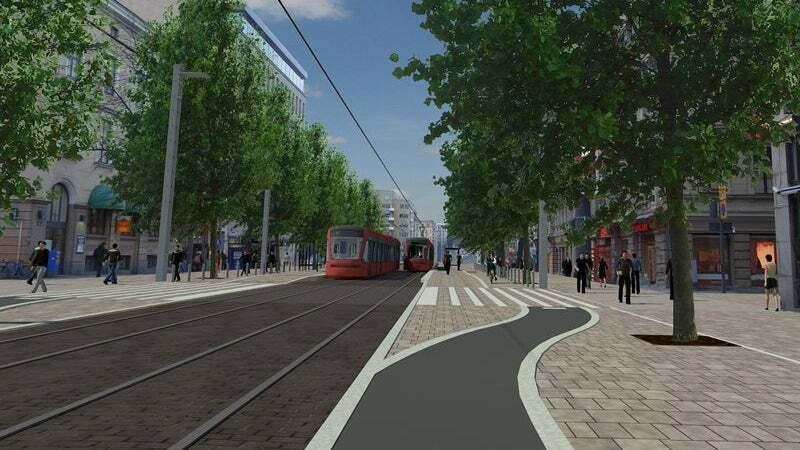 The Tampere tramway will reduce congestion on Tampere roads. Image courtesy of Alexander Savin. The first phase of the project will link Hervanta with the Tays Central Hospital, through the city centre / Pyynikintori. The route will be further extended from the city centre to Lentävänniemi in the second phase. It will form part of Tampere Public Transport system when fully operational by 2024. Construction on the Tampere tram project is expected to begin in April 2017 and the line will be opened for traffic by 2021. The estimated cost of the project is €282.9m ($306m). The tram project is being implemented by The Tram Line Alliance using the alliance contracting model. During a development phase that commenced in July 2015, a detailed implementation plan of the tracks, street planning, stops and the depot was prepared for the project. The development phase also made several modifications to the general project plan, including a new power supply and feeder station for the tram depot, longer rolling stock and additional tram stops, which increased project costs. The construction of the tram project is expected to be undertaken in two stages. The first stage of the project commenced in April 2017, while the second stage is expected to begin in 2021 with completion scheduled for 2024. The first stage will stretch for 15km, between city centre, Hervanta and the Central Hospital, with a depot planned to be built in Hervanta. It will include the construction of eastbound lanes with two tracks along Pyynikintori – Hervantajärvi – Tampere University Hospital, in addition to the depot area in Hervanta, and tram and bus transfer stops. The first phase of the project will involve the construction of tramline, stops, a depot area, power supply stations, bridges and structural support walls. It will also include the installation of technical systems, overhead line, traffic lights, information networks and surveillance and control systems, lead and cable transfers. The second phase will include the construction of westbound rail network from Pyynikintori to Lentävänniemi. Transtech received a contract from Tampere City to supply rolling stock for the Tampere tram line in 2016. The scope of the contract includes supply of up to 20 trams and maintenance of the light rail vehicles for a period of ten years. The modern low-floor trams will run at 7.5min intervals during day. Each vehicle will have a top speed of 70km/h and an average speed of 20km/h. Each tramcar will have the capacity to carry 240 passengers. The contract to design and develop the project was awarded to a consortium comprising VR Track, YIT and Pöyry with subpartner Ratatek Oy in 2015. The consortium is responsible to provide a detailed plan for the design and construction of the tracks, street planning, stops and the depot. The original estimated cost of the project was €250m ($268m), which was revised to €282.9 ($306m) during the development phase. The Finnish government agreed to fund €71m ($76m) in April 2016, of which €55m ($59m) will be allocated for the first phase and €16m for the second phase. EMRAILS holds and supplies the largest, most comprehensive range of ex-stock rails, available for immediate delivery in Australia, New Zealand, and various export markets.